Gallery of emotional feelings for cosmetic make-up. Art of cosmetic make-up is means for attraction of man's attention, and for this purpose not only joyful or open facial emotions are necessary, but also sad or quiet emotional expressions of a female face can be attractive to men. The quiet mouth seems glad as eyes and eyebrows express joyful emotions. Joyful eyes and eyebrows seem calm as the mouth expresses quiet emotions. Eyes and ideas express fascinating pleasure, but feelings of the person are silent. The person does not feel pleasure as if mind realizes cheerful desires but keeps silence of feelings. 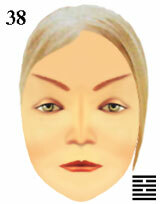 feelings of female face and attractive cosmetic make-up.